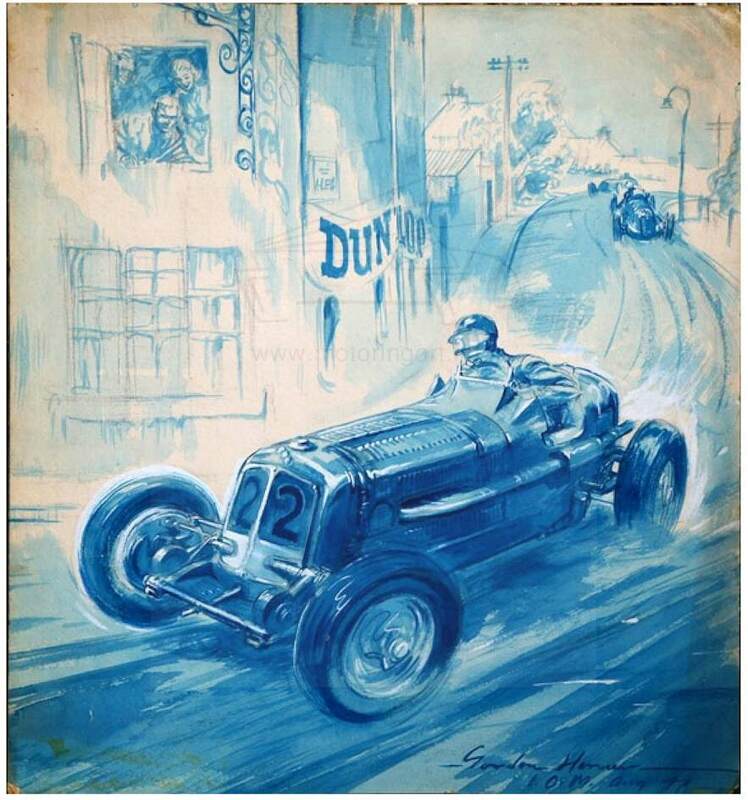 Gordon Horner was the last major artist working for The Autocar who he joined in 1946 until his retirement in 1980. Gordon Horner was born in Yorkshire where he studied at Leeds Art College. As a youth he was always interested in military art particularly the works of Caton Woodville and the pictures he had sent from the Boer war fighting. 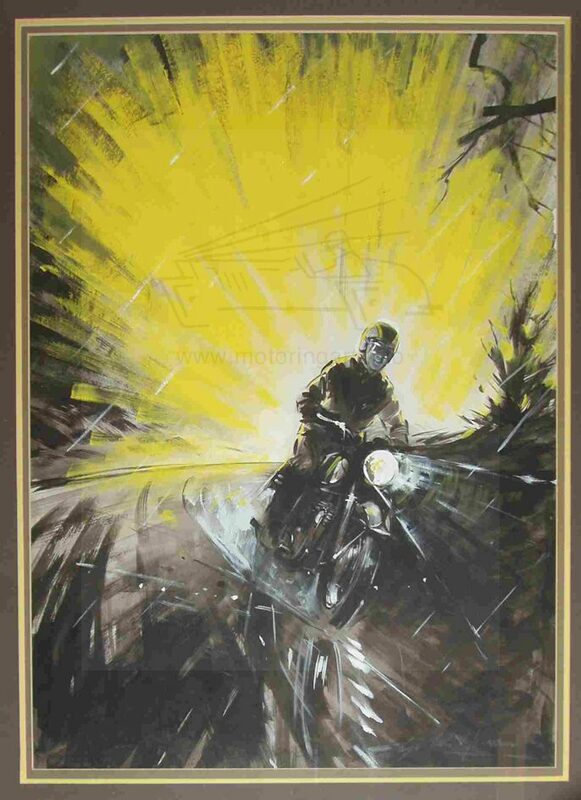 After college Gordon Horner worked at some commercial art studios before winning a competition and becoming the war artist for the Sunday Chronicle where he worked for two months before volunteering for active service. 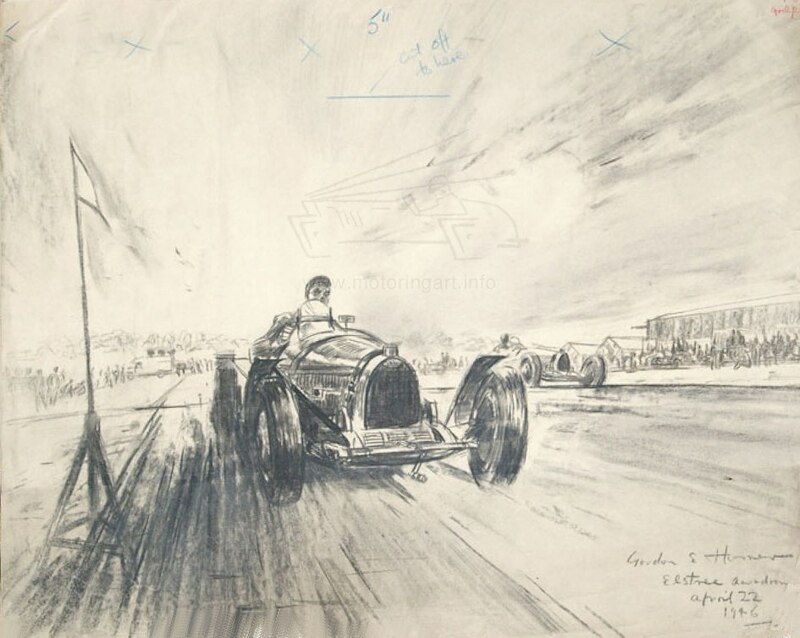 The next part of the story is covered in Horner’s book – ‘For You the War is Over’. He fought and was captured in the desert and then passed through a succession of prison camps in Italy and Germany before being liberated. 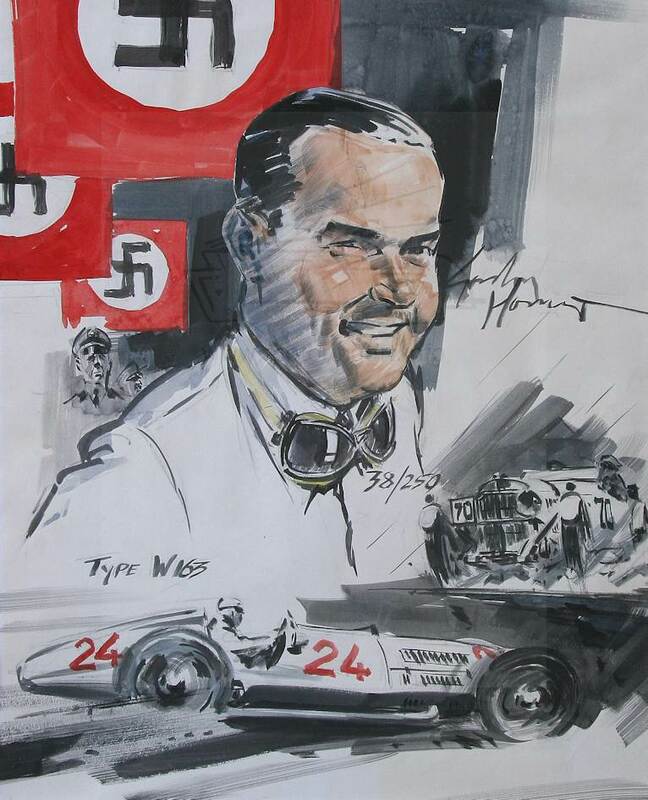 The surprising thing is that he was allowed art materials and kept his prison camp art. This was published in his book which was a limited edition of 500 copies subscribed to by his fellow prisoners of war. 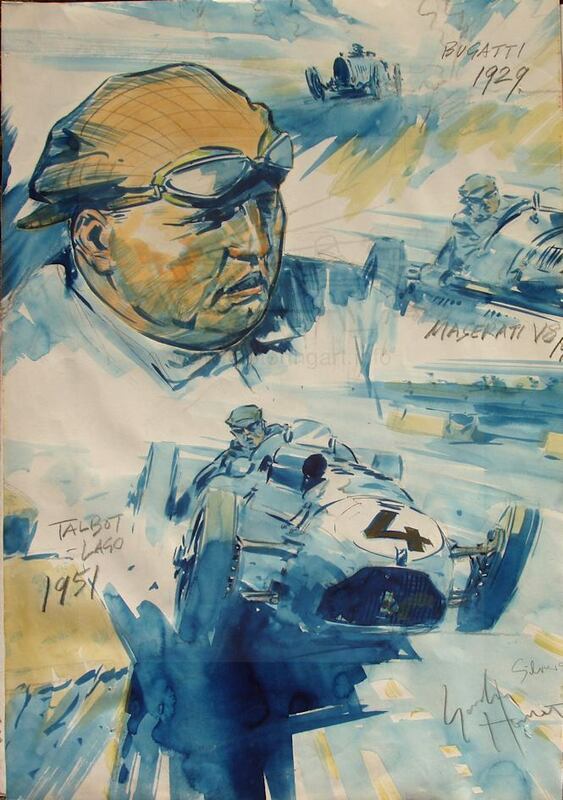 In 1946 he joined The Autocar and Illife press where he worked for the rest of his working life. 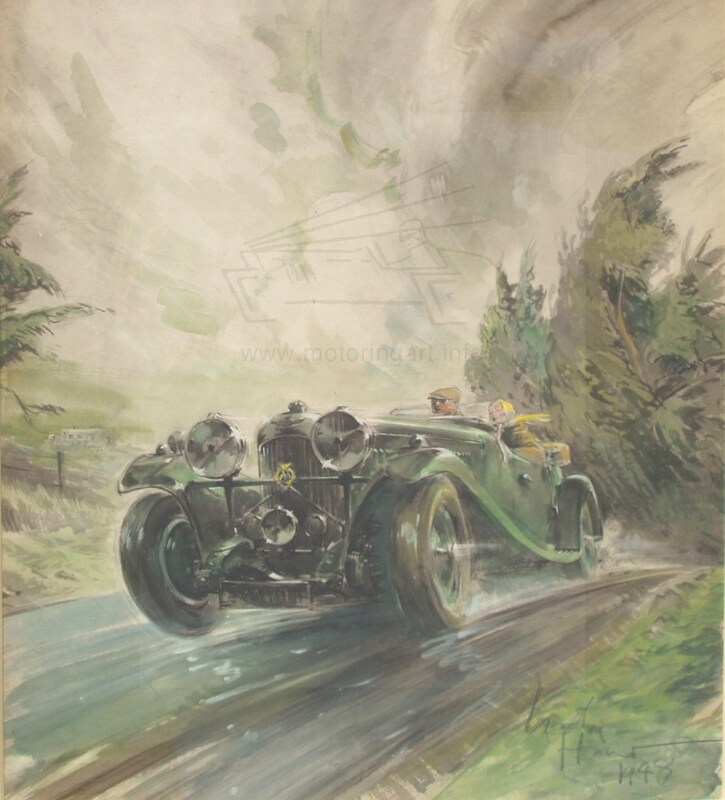 Besides The Autocar Gordon Horner produced work for such magazines as Motor Cycling, Farmer and Stockbreeder, Flight and in later life Classic Car. Initially his style was similar to the work of Gordon Crosby but with increasing rheumatism in his hands he had difficulty holding small brushes. Hence he worked on larger sheets of paper and his colours became brighter often using pure colours particularly blue, yellow and red. 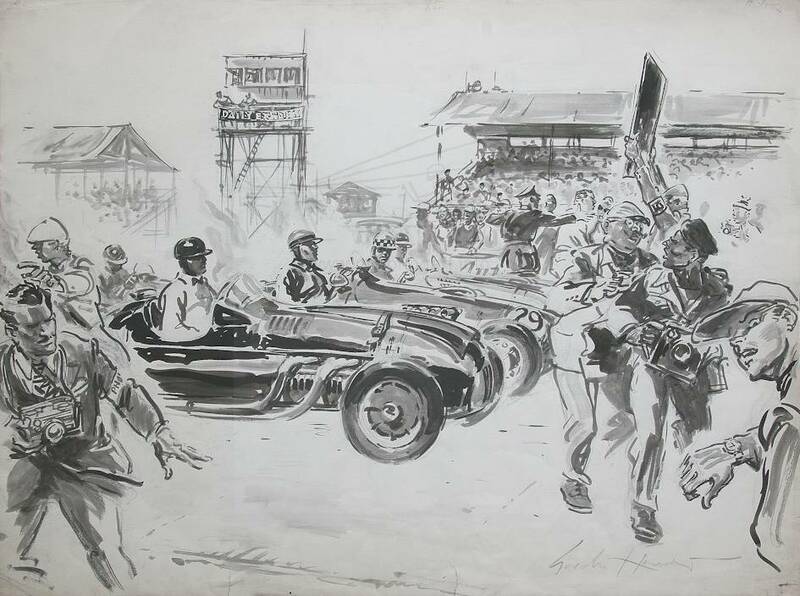 Gordon Horner’s work is very vigorous and superbly captures the scenes of the time. 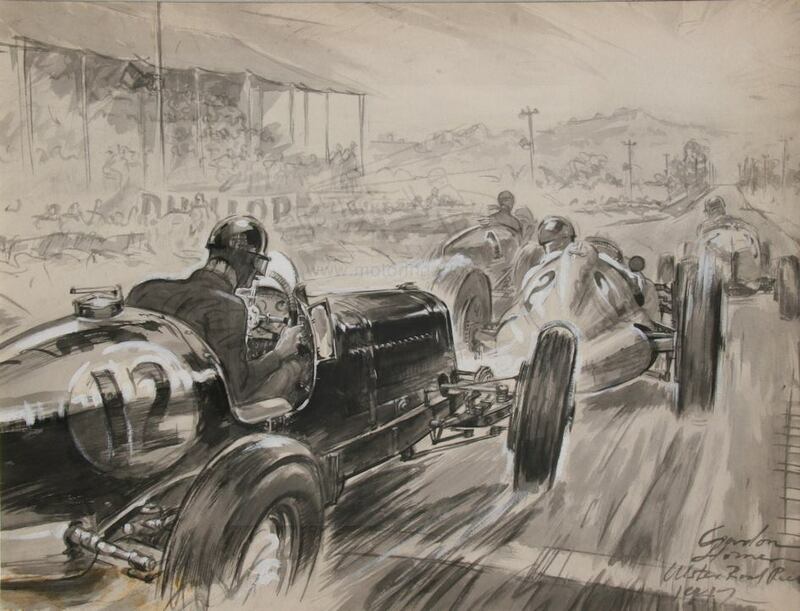 Most of his work was in black and white gouache with some smaller pencil studies. 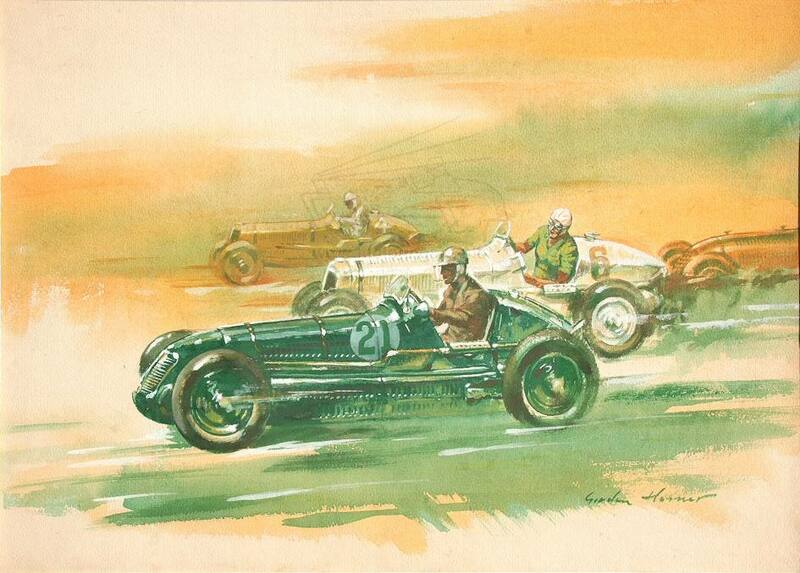 Colour work in gouache was used occasionally for The Autocar but his work was used for other publications such as the annual Castrol Achievements. 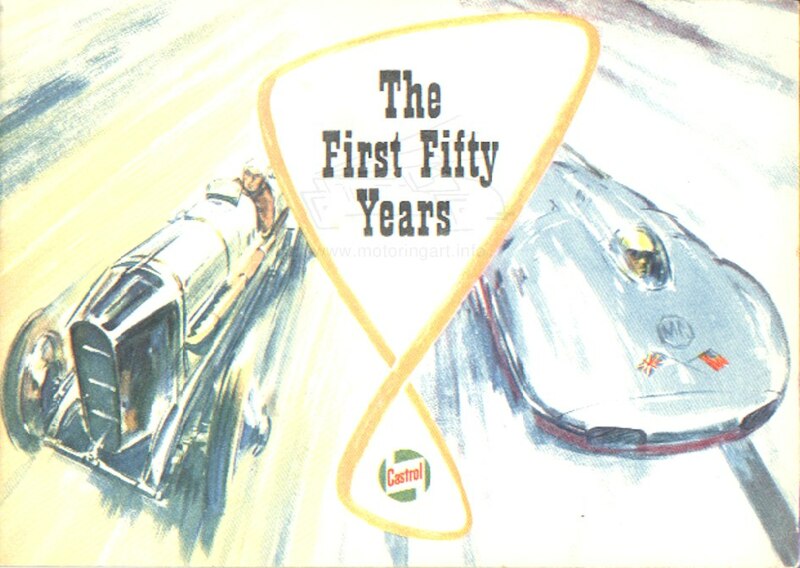 The Castrol colour covers by Gordon Horner are particularly noteworthy. 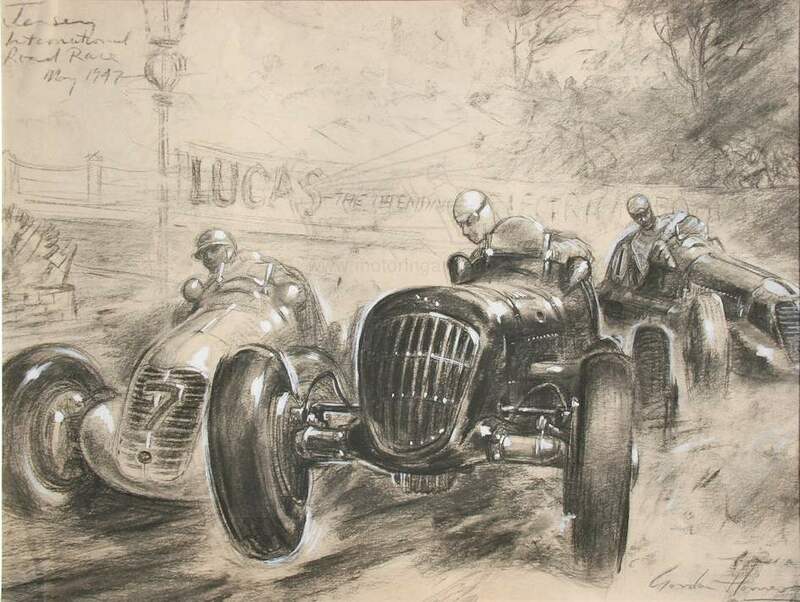 Unfortunately recently some forgeries of the Castrol artwork have appeared for sale. 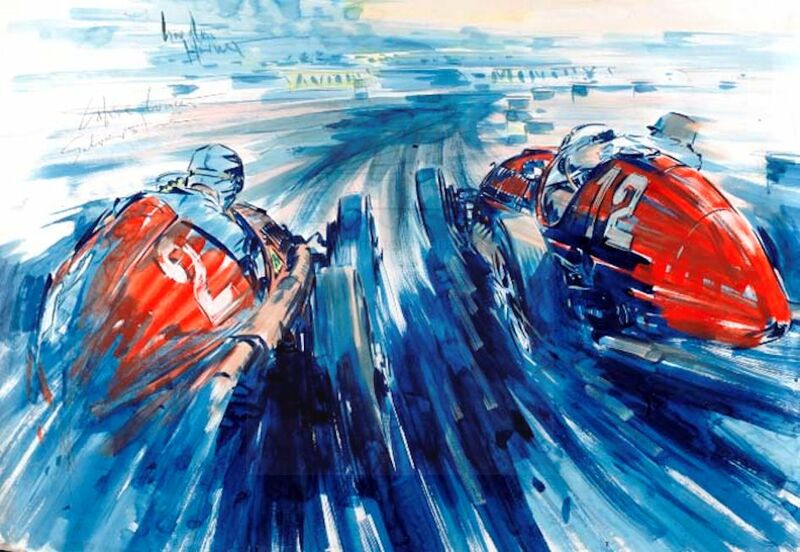 He was very much the commercial artist/illustrator and did not get involved with the sales of prints etc to collectors and apart from very few private commissions all his work was for commercial organisations. 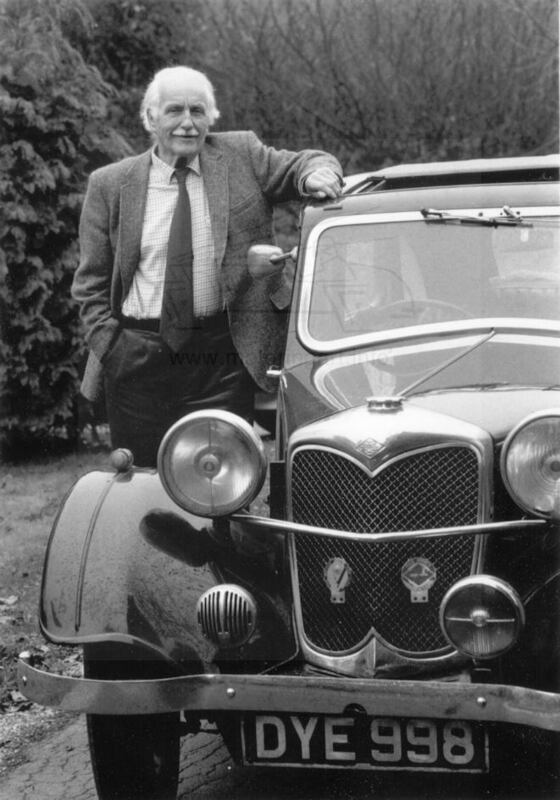 Gordon Horner was a lifelong motoring enthusiast and was a long term Riley car owner. 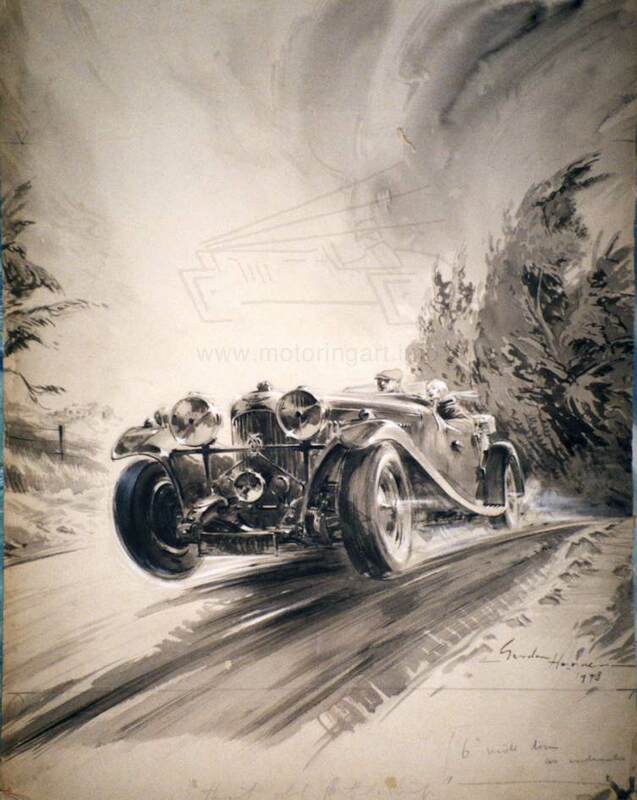 Also on behalf of The Autocar he attended motor races at home and in Europe. 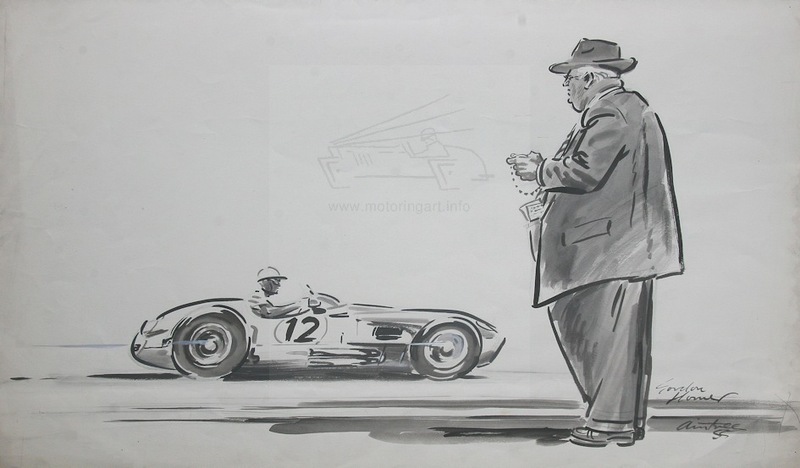 It is surprising that the Autocar would fly their artist out to cover such races as the Targa Florio and not ask him to work from photographs in a home studio. He was also a frustrated author who wrote several articles and often did the text for a long series (about 70) of road safety incidents entitled ‘Look Out’. These articles in The Autocar consisted of a picture by Gordon Horner with text highlighting the dangers of day-to-day motoring. Because of the rheumatism to his hands Gordon Horner did very little original work after his retirement but did amuse himself by colouring up some of his earlier monotone work. Hence the original which originally was published in black and white can now be found coloured. He died aged ninety in 2006. 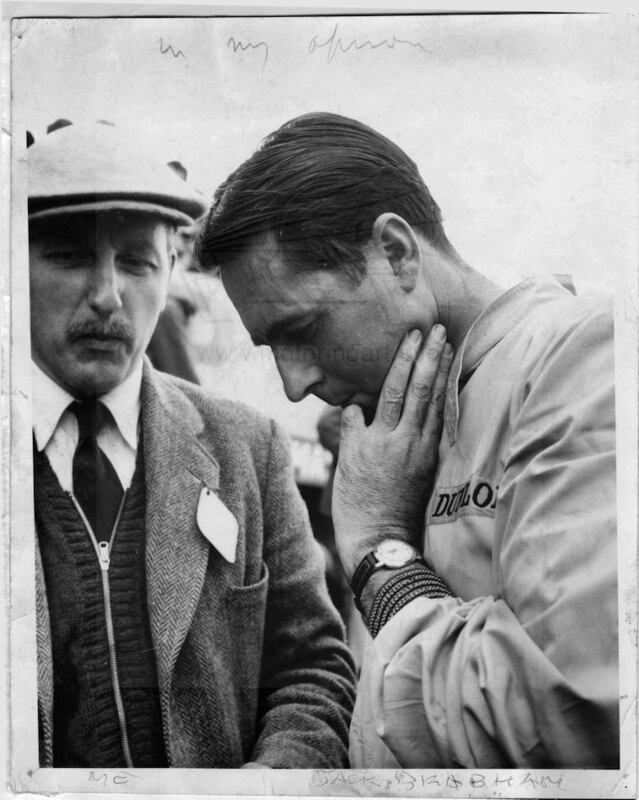 Gordon Horner talking with Jack Brabham telling him how to drive round Silverstone?